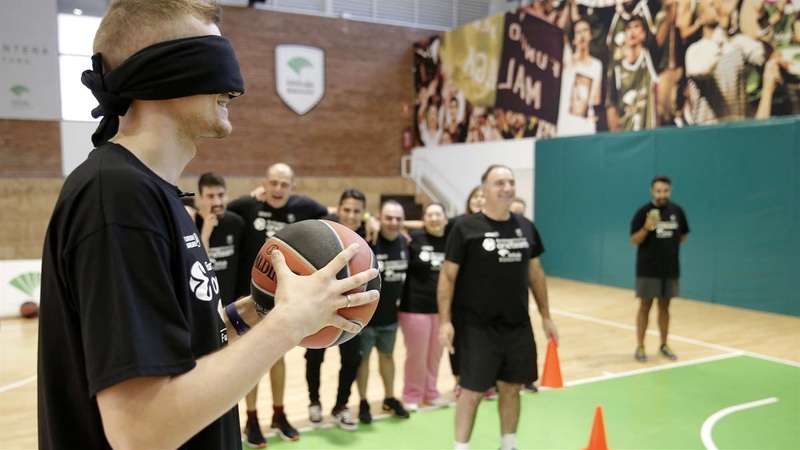 Unicaja Malaga is carrying out its One Team program with three different groups during the 2018-19 season. Firstly, the club is working with Proyecto Hombre for the sixth consecutive season. Proyecto Hombre was established in 1985 to provide solutions for treatment and rehabilitation from drugs and other addictions, and Unicaja is working with each group for eight weeks, engaging up to 20 young people at a time. Each session lasts for 90 minutes and finds ways to motivate and encourage their participants by integrating them into the activities of the club and running social events to which friends and family can be invited. Unicaja’s second program has been developed with a new partner, Down Malaga, an association which was founded 20 years ago by a group of parents whose children have Downs Syndrome, with the objective of improving their quality of life and giving them more independence. 14 young people, aged 15-25, will learn different life skills through specially designed basketball drills during eight sessions. The main objectives are building self-confidence and motivation, teamwork, humility and discipline. This program is also supported by Unicaja Foundation and its Volunteers Club, as well as the Basket4Life initiative. The sessions are taking place at Pabellon de Guindos every Wednesday from February to April.